When you ask a witch what drew them to witchcraft, generally there is trauma in their past, or dissatisfaction in some area of their life. Witchcraft gives us the power to change our current reality through understanding the power we hold and learning how to use it. The first step to any transformation in your life is to release unhelpful thoughts and mindsets by changing your thinking patterns and reprogramming your mind. Affirmations that align with what you want to see in your life are a wonderful tool for this. Just like with anything, change isn’t instant, but using affirmation can accelerate the change, it’s only a matter of choosing the right ones. So, how do affirmations work? You can think of affirmations as planting thought seeds in your brain garden. The more you way them, the more they grow and blossom and eventually produce fruit. The use of affirmation is also back by neural science. They’re not a replacement for medical treatment, but when used regularly and intentionally, they can be used to alter your overall mental health. Each time you tell yourself something, it is reinforced in your brain pathways, which strengthens the connection between two neurons. For millions of years the water has followed the same path through the land. In this time, the constant flow of water carved a deeper and deeper indentation into the land. As the indentation deepened, more water was able to flow through it, which caused the indentation to grow in depth and width even faster. This is how affirmations influence your brain. The neurons that fire frequently grow stronger and form a complex network that respond when triggered by the events in your daily life. Your brain is a collection of beliefs and thought patterns that have developed since childhood. Some of them are helpful, some work against you. Your brain eliminates any synapses that are no longer being used. Lucky for you, you can decide which of these pathways your nurture and which you allow to fade away. Affirmations are a really powerful tool to help you reprogram your mind so that it is a network of beneficial synapses. Your brain doesn’t recognize what is real and what is made up. It understands and forms beliefs around what you tell it. A lot of the truths your brain understands were formed during your early childhood and may not be accurate representations of what is true now. As an adult, it is important to reexamine these convictions and determine whether they are appropriate. In other words, you can use the power of affirmation to rewrite your story so that it tell the reality you want rather than the reality you have. To do this, you first need to be familiar with your subconscious and how it responds to events in your life. Your subconscious mind develops automatic responses to your learned behavioral patterns in order to respond to your circumstances. This is an evolutionary process that developed for early human survival. It allows you to respond quickly without needing to examine every detail carefully. Some of the thought patterns and beliefs you have developed keep your day going smoothly, others may not be helpful to you and how to respond to certain stimulus. When you are confronted with a problem or a conflict, you have the option to use affirmation to challenge the unhelpful learned beliefs and thought patterns. These simple statements replace the fruitless thinking pattern with self-nurturing beliefs. A good set of affirmations will help you to consciously shape the thoughts and words that reflect the reality you want to see. Later on, I’ll share some tips for helping you to write your own positive affirmations that will help you focus on achieving your specific goals. If you click the button below and enter your info, you can download a list of affirmations you can use for a variety of purposes. Click the button below to have this PDF sent straight to your inbox. From there you can download it and save it to your electronic device for reference. Affirmations are an exciting tool to help you shift your mindset and ultimately make changes in your reality. They can be used for any transformation no matter the size. However, the bigger the change you want to make, the larger the gap will be between your inner truth—what you believe to be true—and the reality you want to see. This can result in acceptance or resistance. Resistance is what happens when your subconscious mind chooses to focus on the perceived inner truth in order to avoid truly examining the problem. It is the the overwhelming feeling of discomfort or disconnect that you experience whenever you try to state your affirmation. If you are experiencing strong resistance, consider enlisting professional support. Acceptance is the process fo reappraisal that happens within your mind and results in the change in your beliefs or the way your respond instinctively. When this happens you will feel a sense of wellbeing and joy. When you experience these sensations, it is a good indication that your affirmations are working. It’s a process, but if you are ready to commit to a change, it is possible through determination and preparation. Every time you repeat your affirmation with conviction and confidence, you are carving the pathway to change. Even if you encounter resistance, eventually you will break through to acceptance and when that happens, your subconscious will automatically re-examine the core beliefs and thought patterns you have learned throughout your life. It will identify the beliefs that are not helpful or do not align with the statements of affirmations you are telling it and replace them with a new set of truths. That’s when the change begins. Affirmations work by reprogramming your thought pattern, changing the way you feel about certain situations, and replacing dysfunctional beliefs with new truths. Your subconscious is a web of truths you have learned to believe, with some beliefs based on earlier beliefs. Once you start unraveling your original inner truths, those formed later also become unfounded. Your subconscious mind re-examines each of them, which brings you into a period of introspection. Eventually you are lead to the desired outcome where the affirmations reflect not only your inner truth but your outer reality. Affirmations can serve you as a catalyst for change in virtually every area of your life. You can use them for simple things like changing your eating habits or more complex things like experiencing prosperity and contentment. Keep in mind that this all depends on the words you use to talk to yourself. Affirmations can be helpful or hurtful. Affirmation simply means a statement or a declaration, there is no qualification of good or bad. Hurtful affirmations leave you feeling ineffective, keep your trapped, and rob you of the personal success you want to see in your life. Helpful affirmations work against these ideas and help you to build a solid, strong, and effective thought habit. 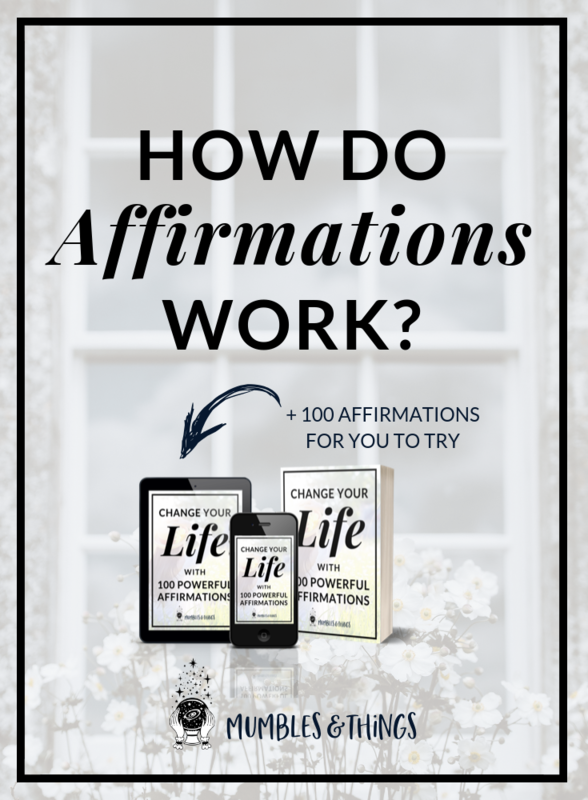 Using affirmations allows you to take back control of your narrative. As I mentioned, most of your beliefs were formed in early childhood meaning they are heavily influenced by the people who guided you during this time: parents or guardians, siblings, teachers, religious leaders, coaches, etc. Most likely, these people had good intentions but some of their words may have been harmful to who you are today. The power of affirmations can help you manifest huge changes in your life. Use them to reach these deep recesses of your mind and break bad habits, find love in all areas of your life, succeed in everything you set your mind to and generally discover the life you are meant to live. When you buy any Mumbles & Things gemstone bracelet, you will receive with it a personalized affirmation according to the gemstones correspondences. Shop the selection below. Do you recite affirmations? Tell me about it in a comment below.